Couching history lessons in massive servings of food ensure the former become easier to swallow – and harder to forget. Mark Bryan Ocampo runs his day-long food tour of the Philippines province of Pampanga by this maxim. 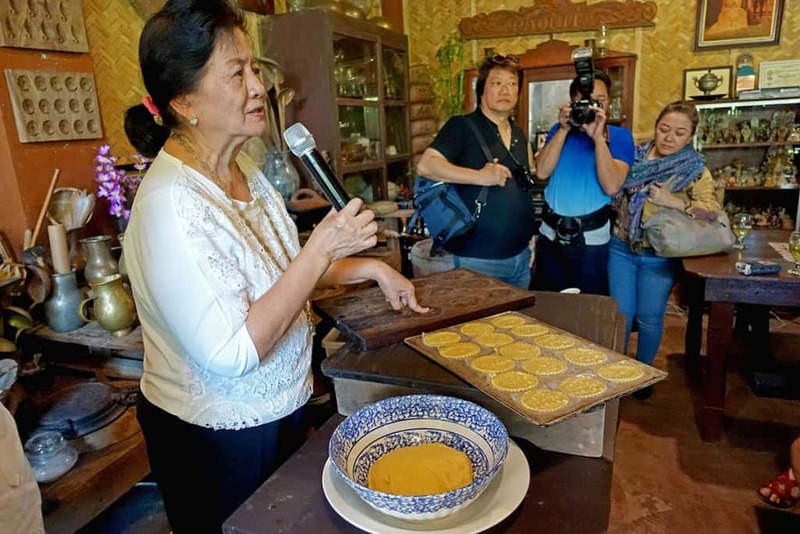 Take it from my personal experience: Mark serves up helpings of history and Kapampangan food doled out in giant sizes throughout his tour, making a case for putting Pampanga at the core of Filipino culture. I talked to him about his tour – still going strong after several years – and why it’s still great fun. It’s been a while since I was a guest on your Mangan Kapampangan tour. Has the itinerary changed in any way? Not that much; there’s a wood carving shop, now, did we go? Betis Galleria, that’s what I added. For Christmas season, I bring them to the parol factory after dinner. It depends on the season. Your tour does a great job of explaining Filipino culture through a culinary lens. What makes Pampanga an ideal venue for this kind of narrative? From my observation, the process of indigenization – if you don’t have any available ingredients, people would have to improvise on what’s there in the land. And the land of the Kapampangan is really fertile – [the local ingredients are] indirectly changing and transforming the dish from the original that we know of, to something that’s uniquely ours. I think that’s how our culture works – we’re not really big originators, our idea of originality is borne from the ability to adapt foreign influences and come up with some thing new, which is so true with Kapampangan cooking. Where do you find the dividing line between a foreign dish and a Kapampangan one? For the local chef, experiencing a dish that is foreign to them, if the taste is too foreign they have to tame it to make it familiar. One analogy is that [we Filipinos] put patis on anything, to tame the alien flavor! Same with Kapampangan cooking – that’s what fits our taste buds. The propensity of the Kapampangan, if it’s something sweet, how do you make it sweeter? Intense flavors. The Kampapangan have a sweet tooth, because it’s sugar country. One more technique of the Kapampangan is the stir-fry – they’re good at stir-frying, that’s a skill they learn over time. It’s not surprising that whenever we hire cooks, they’re usually from provinces like Pampanga or Negros – where the land is fertile and the food is good as a result! 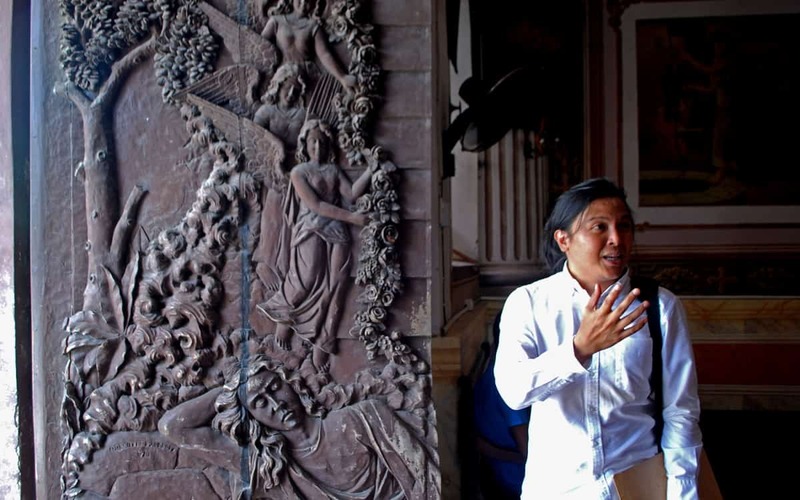 How does the terrain of Pampanga influence the food and culture? My theory is that because of volcanic eruptions millions of years ago, it made the soil of Pampanga really fertile. The only landmark in Pampanga, it’s a very flat area, is Mount Arayat, and that is a volcano. And with the rich bounty of Kapampangan land, they can afford to be wasteful, or to experiment. I was in Ilocos last July, I tried to make a food tour there but the selection of food there is really limited. Because their environment is arid; they cannot afford to waste. Half a kilo of pork, they can extend it for weeks. The Kapampangan, you give them half a kilo of meat, they’ll eat it in a day, or even in one meal. In terms of the selection of flavors, when I am comparing the cuisine of Ilocos and Pampanga, I just think that Pampanga has a broader menu. I think a lot of Ilocanos will be mad at me for saying that! I guess that’s where the Kapampangan reputation for arrogance comes in. It’s the land that influences them; they can afford to be wasteful. Pampanga became rich, the de buena familia (influential families) came from there, even migrants who gave us names like Cojuangco and Tantingco. They got rich in Pampanga. We meet several very interesting characters in your Mangan Kapampangan tour. Could you tell me a little more about them? For me, the most interesting character is Aching Lillian [Borromeo]. She knows the heirloom recipes, also the old-style cooking, home cooked meals. It’s also the way that she projects herself, “Atching” means “big sister”, she wants to be seen as a big sister in the kitchen. She’s not selfish in sharing her recipes, compared to other cooks and chefs whose recipes die with them. She never runs out of stories, especially if she likes you! In Santa Rita, Ramon Ocampo [proprietor of Ocampo-Lansang] is always worried that we don’t see workers in his workshop on a weekend, but to me it’s more important that we meet him. He tells us stories about his aunt [who still works there despite advancing dementia] and his family. He’s getting on in age, but his family tradition will carry on after him through his nephews and nieces who know how to cook turrones. The shop will be 100 years old in 2 years’ time. For me, the start and the end of your tour were especially memorable. Tell us about those stops. Our breakfast stop, Lapid’s in Guagua, their lechon is a point of pride for Guagua locals. 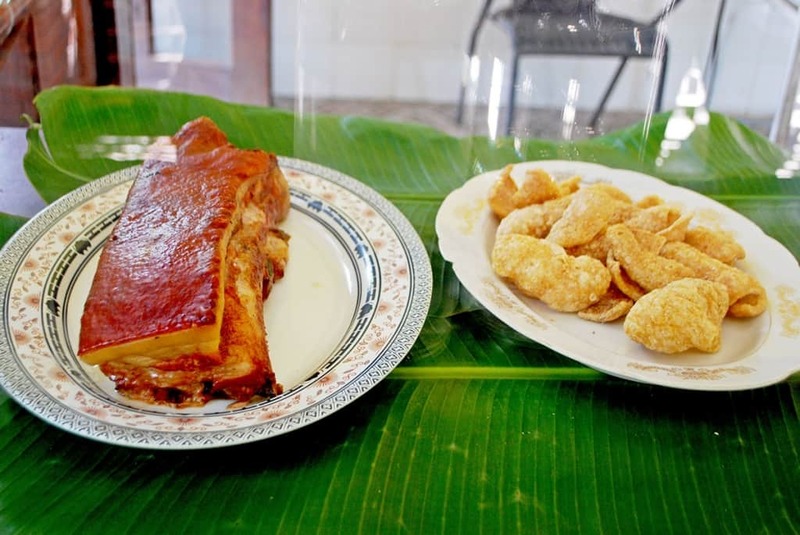 They want to promote their town – it’s a little known secret now, but they want it to be known through word of mouth, because their lechon is competitive. They’re also proud of their local products: crab fat, chicharon, all of these are local products made in Guagua. For Everybody’s Cafe, I love their accommodating presence and the selection of food – covering Pampanga’s traditional and exotic. My favorite is their leche flan, made from duck’s eggs – very rich – as well as their silvanas and kaldereta. They’re very well known for their exotic food – I saw the actual harvest of camaru [rice field crickets], how they remove the appendages and everything. It’s really authentically Kapampangan. What surprises your guests the most about your tour? They’re quite surprised that there’s a place like this, only two hours away from Manila. They can do a lot of things in a day. Also, the role of the Kapampangan in our history and cuisine – sometimes we talk about ‘national’ this and “national” that, “national” hero, “national” food. That’s nice and all, but they don’t realize it originated here in Pampanga. Even the churches are impressive, I’ve had Catholic Filipinos come to Betis Church, they’re always floored – they never realized that we have churches like this in the Philippines. These churches show off Kapampangan creativity – it shines, and at the same time, it’s preserved to this day. It also shows local devotion – even after a flood, they’ll clean the church out and go to Mass later as if nothing happened. [Half-buried] Bacolor Church shows how thin the line is between fanaticism and faith in Pampanga. Sometimes their religiousness is up to the Nth power – remember it’s where you see crucifixions and flagellations during Holy Week! When people are thinking of booking your tour, what’s your elevator pitch? Food is the best way to communicate something – history, culture, food is the best bridge. 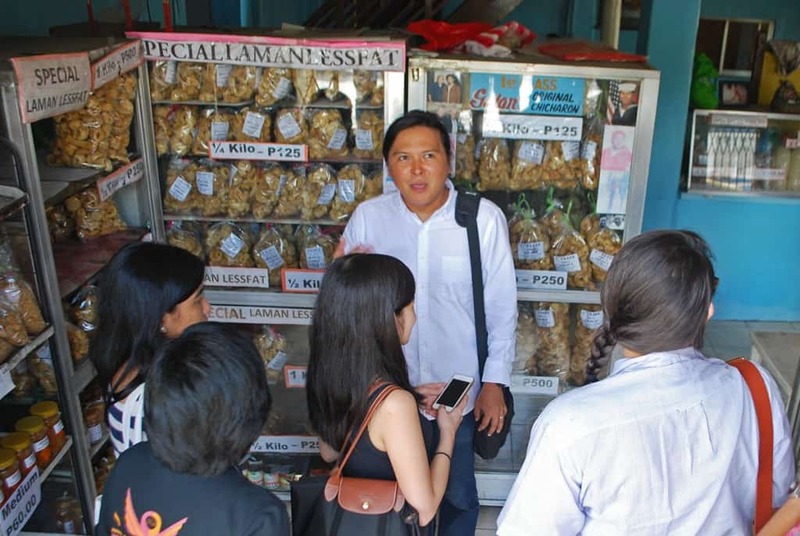 Taking the Pampanga Food Tour is the best way to know the history of the country, as shaped by the Kapampangan. Why are Kapampangan so arrogant? and i think it’s because they have good reason to be arrogant. The first Jesuits, first doctors, first nurses, first nuns, first what have you, were Kapampangan. Our history is quite Tagalog-centric, because everything happens in Manila – but on my tour, you’ll realize it wouldn’t happen in Manila if it weren’t for the Kapampangan!